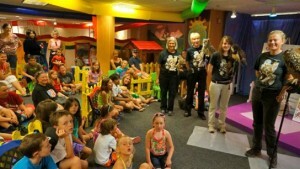 Beaver Creek Children’s Museum – Blue Creek Productions, Inc. The Children’s Museum at Beaver Creek Resort is filled with fun and educational exhibits for children and their parents to enjoy and interact with. Children ages infant through 12 years old will find lots of fun things to capture their attention. For the younger visitors there is a special area just for them entitled Toddler Town. This room is filled with brightly colored decorations, soft plush toys, simple games and mechanical exhibits to test their growing dexterity. The area is soft and safe so the little ones and their parents can relax an enjoy their time together. For the older kids there are many exhibits to educate or simply entertain. Some of the exhibits featured at the museum are Professor Quackenbush’s Workshop – filled with building and construction themed mechanical activities, The Kids’ Computer Zone – featuring educational and fun software, Banana Jones’ Jungle Science Lab – a rainforest adventure camp filled with natural science books, specimens, tools and squirmy things, and J. B. Tucker Showman’s Theatre – a working theatrical stage filled with costumes and props for the kids to create their own show.